I recently had the luxury of having an hour to myself in a second hand book store, and I wanted to share with you some vintage crochet book reviews of the lovely volumes I found. Along with some great ways to modernize the gorgeous vintage crochet patterns that you find. A lot of things are very different when you become a parent, but one of the biggest for me is the lack of ability to linger. My daughter does everything at light speed, with maximum enthusiasm and minimum spacial awareness. As you can image, old, fragile and jumbled places aren’t exactly her ideal habitat. I was therefore thrilled when I not only got to spend the time to search properly through the shelves, but came across some fabulous new crochet books in the process. As they were all together I imagine were previously a treasured part of someone else’s crochet book collection. My own has become quite extensive in the last year, and I am perhaps overly pleased that these can join my adored shelves. I thought I would copy a few pages of these books for you, and hopefully inspire you not just to hunt down your own vintage crochet books, but also share some tips with you so that you too can experiment, reproduce and modernise the patterns you find in vintage crochet books! Vintage is a word thrown around a lot at the moment. Which begs the question, what does vintage actually mean? Directly in terms of the dictionary, I am pretty sure that something’s vintage is simply the year in which it was made. This is certainly the case when you are talking about wines, for example. Vintage is more vague, but can therefore provide a good ‘blanket term’ for anything that’s a bit old! A good rule of thumb for anything vintage is that it was made at some point after 1945 but before 2000. Vintage crochet books tend in my experience to be from the 1980’s, when crochet had it’s last big popularity spike. 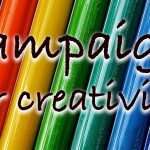 I like to think that crochet is having another trendy period at the moment, and I am always excited by the idea of learning from other crocheters as well as taking their work forward to make it apply to us today. Is vintage crochet different to modern crochet? Vintage crochet is different to modern crochet, but predominantly only when you look at the finished articles. 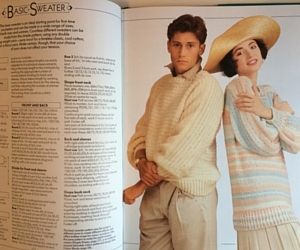 Fashions change and these vintage crochet books are certainly a product of their time. Although fashion is circularly and trends recur, there are always noticeable variations on the previous type. As you will see when we look at the crochet jumpers book below especially. The stitching however is often just the same. The terms seem to be consistent with those still used today, and the style of writing patterns is close enough to reflect our own. If you have been crocheting for a little while you will appreciate the even now pattern styles differ between crocheters quite significantly. Some preferring pure staccato abbreviations, others fuller explanations and paragraphs. The beautiful thing about vintage crochet patterns is that you don’t just have to keep them in their fun original form, you can also manipulate them to make something modern. Often with relatively few changes in the process. 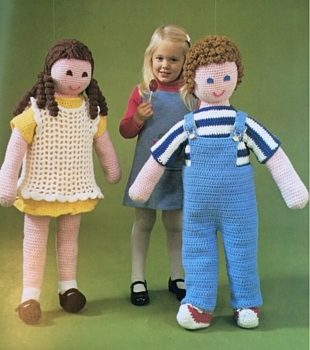 Can you use vintage crochet books to make modern crochet clothes, toys and accessories? Vintage crochet books are fabulously relevant. Especially these 80’s books I have my hands on. Yes, some styles are quite funny (as I’m sure what I am wearing now will be in 30 years’ time). But the important fact is that the craftsmanship and essence of them remains beautiful and unique, over the years and across the various trends fashion moves through. 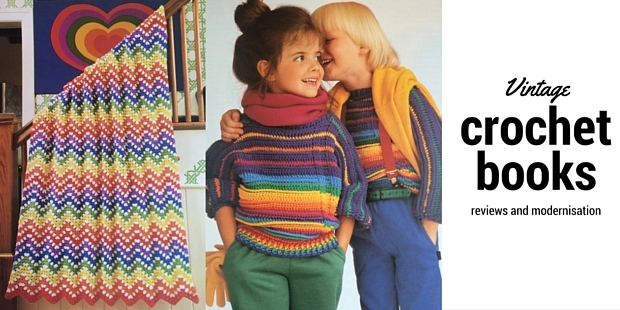 Can you modernize vintage crochet patterns? Some patterns you will find can be modernised simply by using a plain coloured yarn, a different textured yarn or less color variation. For clothing patterns adjusting the sizes of the sleeves or collars can bring something straight out the 80’s and slamming into 2016. But it’s worth remembering that you don’t have to modernise these patterns for them to look incredible. To become toys kids will love, decorations that will give your home character or clothes that will make you look like you stepped straight off the cat walk. So with all that in mind, let’s take a look at the first book! For those interested in the history of fashion, Sylvia Cosh may well be a familiar name. Taught to crochet from a very young age, she and her husband had an extremely success business producing amazing clothing, sculptures and wall hangings. These were very popular and exported all around the world. 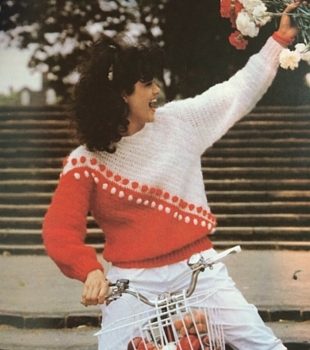 The Crochet Sweater Book is a compilation of some of Cosh’s favourite crochet jumper patterns. It was first published in 1987 and the fashions reflect the times. If you watch any late 80’s TV or look at your own childhood photos, the styles won’t seem odd but they will seem somewhat dated. But I certainly didn’t find this off putting when reading through the book, in fact it was quite fascinating. There are aspects that I had forgotten about the word I grew up in as a small child that I feel quite nostalgic about. The bright colours, the lines and the soft textured wools leap out from the pages. This said, although most patterns will require at least the sleeves reducing in size, there is one I shan’t be changing at all. 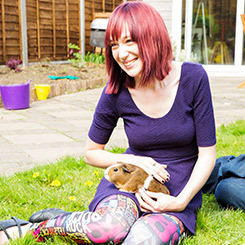 Although as you can see from the photo the colours are not quite to today’s tastes, the style of the jumper is perfectly suited. In fact, I would go as far as to call it timeless. I have started to make this sweater in a dark grey using a DK wool as suggested, and I will share photos with you when I have completed it. Though please don’t hold your breath for the addition, as it’s definitely going to be slow going! 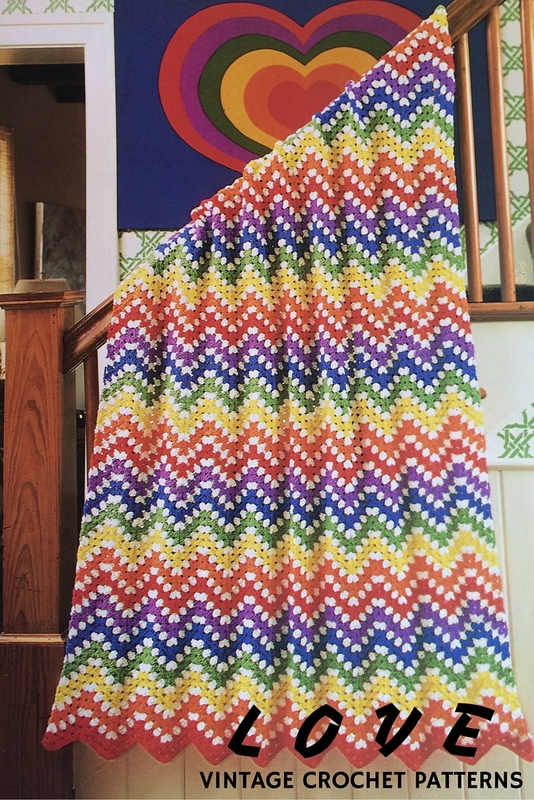 I fully intend at some point to make at least half of the patterns shown in this book. Predominantly bringing them up to date by reducing the stitch count on width of the sleeves, ignoring the block colour changes in the patterns and using a standard DK yarn in place of the mohair and chenille. This book is not just packed with patterns, but has a great section at the start detailing different yarn types you can use, how to pick your colours and choose your crochet equipment. 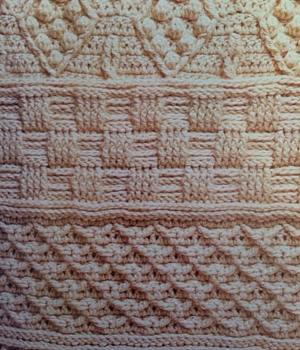 The patterns themselves used explained abbreviations for crochet terms, but are comprised of full sentences with clarifications frequently given. In case you hadn’t guess yet – I am delighted with this book. And the good news for you is that it is often available second hand through Amazon, so you can check it out for yourself! 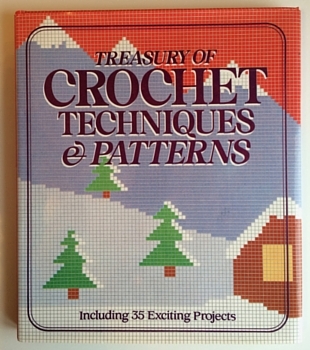 The Treasury of Crochet Techniques and Patterns was first published in 1985 and was compiled by Marshall Cavendish. It gives an incredibly thorough and clear guide of basic crochet techniques, stitches and some really lovely vintage patterns. Still highly relevant today, the techniques are well explained and clearly put. Although the print on my copy is a little unclear in places, and looks as though it always was, it is still readable. The patterns on the other hand for me personally swing wildly from terrific to terrifically inappropriate. Outdated and fairly unadaptable, to beautiful and fabulous without a single change being required. But the good by far outweighs the bad, and even those which don’t suit my taste will definitely be up someone’s alley. Not to mention containing technique instruction that could be applied to a plethora of other projects. I can’t wait to give the so-called Basic Crochet Bedspread a go. Not only is it pictured in a gorgeous colour, it is subtly embellished and textured. 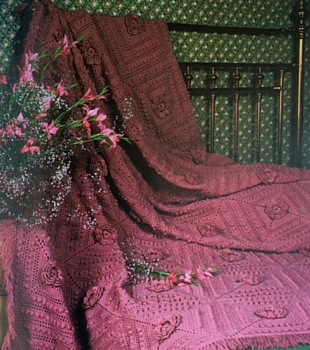 I can’t imagine there are many homes that this vintage crochet bedspread wouldn’t look perfectly in place. I think that it would look fabulous in a baby’s crib, in a patel shade of pink, blue, yellow or green. The lace shawl is also something really rather special. You can’t help but admire the neat and intricate stitching, and exacting production. On the other hand, I will probably skip the short sleeved ‘lacet’. Visually in general, this book is very pleasing to the modern eye. It seems to avoid the clashing colours and more unusual fabrics of the 80’s, giving it a slightly older classic vintage look than it’s 1980’s date implies. The basic afghan rug (left) would look well placed in any home, the basic lacet t-shirt (right) may have had it’s day. A great buy if you ever see a copy, I recommend you grab it. They do apparently occasionally come up for sale on Amazon, though there weren’t even any second hand copies when I chanced a peek today. I will definitely be adapting and putting my own spin on a couple of these gorgeous designs at some point though, so check back for similar patterns on the site at a later date! 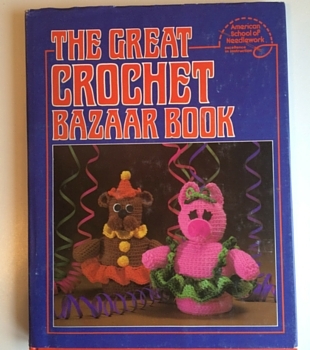 I don’t think I have ever read a book quite like The Great Crochet Bazaar Book. It is, forgive me, a little bizarre. Not something you would get these days, even more different to what we are familiar with now. And I love it for that. It is packed full of charming, if quite unusual and occasionally disconcerting patterns. And that’s only a part of the reason it is so delightful. The last of today’s vintage crochet books was first published in 1982, making it by a few years the oldest of those I recently picked up. It was produced by the American School of Needlework as inspiration for people who wanted hand made items to make for the local church or school bazaar. Now, times have moved on quite a bit since then. Bazaars are a faded trend, shifting away into the sands of time. And although many schools will do a Christmas fete or bring and buy sale occasionally, these are normally festooned with sweets, books and manufactured toys. Not lovingly hand crafted items. Don’t think for a second though that this book isn’t still one worth reading and following the crochet patterns of (in some cases!). It is packed with fascinating trinkets, baby items, shawls, wall hangings and toys. The book also kicks off with a very good section on how to crochet. I think even a completely raw beginner would be able to easily follow what to do, with drawings giving every step of each stitch from the basic chain to the half double crochet. It then moves into the patterns. Some of these are timeless. Beautiful vintage pieces which would be treasured by the owner wherever they were on the timeline. 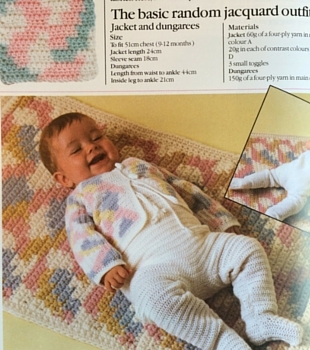 I am really looking forward to making the vintage crochet baby bonnet, ribbed slippers and rainbow granny afghan. There are also some truly amazing toys. My two favourites have to be two of the toys. 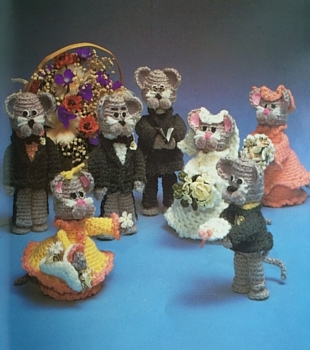 The family of mice at a wedding – I don’t think I have ever seen anything quite like it – and the incredible life sized dolls. The downside of the book is that the pictures illustrating each pattern are in black and white, in some cases making it hard to see exactly what they are suggesting you produce with the crochet pattern shown. Though this is countered somewhat by the glorious large colour images in the centre of the book, which you must check out before starting some patterns. 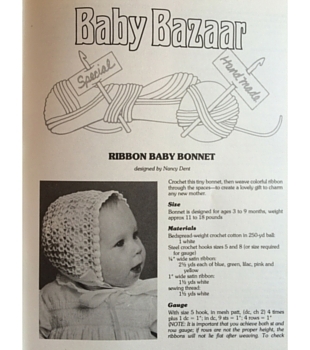 Especially the ribbon baby bonnet, which is rather hard to discern the ribbons in monochrome. But you can’t get too frustrated by this, after all the book is nearly 35 years old. It also has a few patterns which I find slightly creepy, or just plain odd. 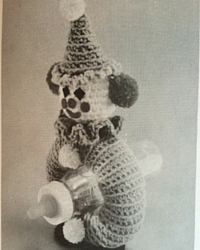 Is it just me who feels quite unsettled when looking at this crochet clown baby bottle holder? But this is a matter of personal taste and time moving forward more than anything, and I still love the book. And frankly probably all the more for the quirky and interesting content. Happily this book is currently available second hand on Amazon market place too. If you fancy something a little different, why not check it out? You can find vintage crochet books on Amazon. Certainly some of those that I have spoken about today are able to be bought, at least from Amazon.co.uk, right now. The problem is in finding them when you don’t know the titles. That’s where second hand book stores really come into their own. As my little girl grows I hope that she will love poking around the dusty shelves as much as her Father, Aunty and I all do. Finding hidden treasures, and sharing them with other people to spread the joys of the talents that went before us. 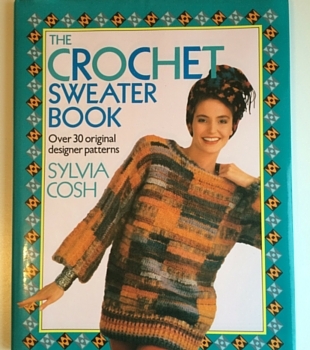 So keep your eyes peeled for other vintage crochet books, and when you find them please do let me know their titles and what you think in the comments section below so that we can all share in the fun!